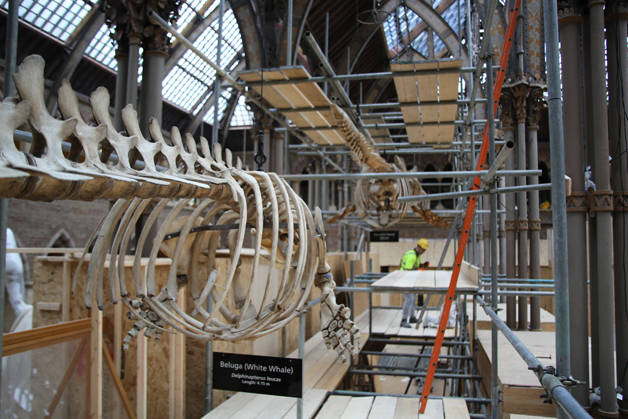 In 2013, the Oxford University Museum of Natural History decided to undertake the conservation treatment of 7 whale (cetacean) specimens, suspended from the museum roof. The specimens, on display for over 100 years, were in need of considerable cleaning and consolidation to allow them to continue to serve the museum as incredible display specimens. This project blog was initially created to capture the conservation process and discuss the material science and treatment rationale when working on such unique materials. However, the whales quickly became stars in their own right, as artistic professionals and enthusiasts were inspired to join us in the ‘whale tank’ to illustrate film and photograph the work being carried out. The ‘Once in a Whale’ blog now serves as a collection of all these experiences. Please use the side bar on the left to navigate posts or search through our archives. The project was supported by the Arts Council England and upon completion was awarded ‘Highly Commended’ in the Conservation and Restoration category of the 2014 Museum and Heritage Awards.